Would you like to train your dog to be smarter? A dog training whistle can be an effective tool for teaching your dog to follow your commands, such as calling him to you, sitting or going in a new direction. We provide you with dog training whistle. The whistle can produce an ultra-sonic sound that is easy for dogs to hear. It takes a bit of time, patience and practice (on your part), but your dog will learn to obey you through various whistle commands. Blow on the whistle and listen. You will hear air rushing through the small opening. What you are hearing is only a secondary sound made by the air forced through the metal tubing; the actual whistle is inaudible to your ears. Adjust the whistle to your own dog. Even dogs can't hear all frequencies. Wait until he is asleep and gently blow on the whistle. Your whistle has a nut and screw that adjust the frequency when turned. Continue testing until your dog perks up. You will then know you have reached a frequency he can hear. Use the dog whistle with varying sequences to train your dog. For example, one long burst can mean 'come,' while a series of short, staccato bursts might mean 'sit.' Keep your whistle commands consistent and your dog will always know what you expect of him. Note: The dog whistle has adjustable pitch for active control of the frequency produced. We know, human’s hearing limit is about 20~20000Hz, while dogs have a wider hearing limit which is about 15~50000Hz. Therefore, the ultrasonic sound of 20000~50000Hz which is out of human’s hearing, can be heard by dogs without annoying people. However, please take note that different breeds may react to different high frequencies, smaller dogs are more sensitive to higher frequencies compared to larger dogs. If you adjust the pitch upper the limit of your dog hearing, maybe YOUR DOG can't HEAR IT. And the dog whistle is a training tool. If the dog doesn't react to the sound, neither means the whistle doesn't work nor your puppy is dumb. The dog's behaviour according to your instruction need to be trained. Such as, at meal time, blow on the whistle before they get the food. It will only take a few times of doing this and your dog will react quickly. 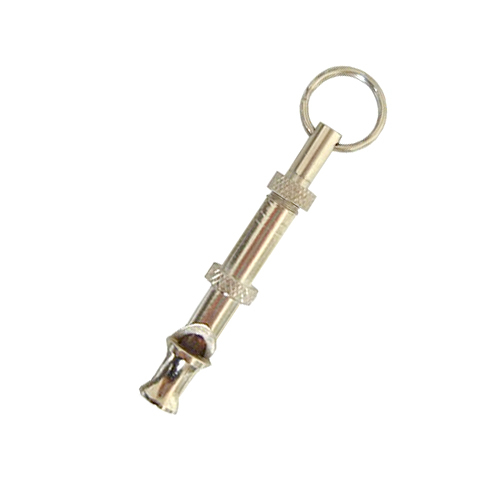 Click the button below to add the Dog Training Whistle UltraSonic Sound to your wish list.